Barcelona head into Saturday’s 'Clasico' against Real Madrid with a whopping 11-point gap over their bitter rivals in the Liga title race -- and they also have the advantage in financial terms, albeit by smaller margins. The two teams are separated by a hair's breadth in the latest edition of the Deloitte Money League, with Barcelona generating 620.2 million euros ($736.74 million) in revenue in 2015/16 compared with Real’s 620.1 million. Barca also sit above Real in the 2017 Forbes Sports Money Index, which ranks clubs according to their estimated value as a brand. The Catalan club are estimated to be worth $3.64 billion and Real 3.58 billion. However, the two Spanish clubs trail Manchester United in both tables. The 20-times English champions had revenues of 689 billion euros and are estimated to be worth $3.69 billion. Barcelona also have the heftier wage bill, according to the 2017 Global Sports Salary Survey, paying their squad an average $8,576,750 annually compared with Real’s $8,092,283. According to Timothy Bridge, senior consultant for Deloitte Sports Business Group, Barca's narrow lead over Real in commercial terms is the result of their enduring drive to build revenues, which began when Ferran Soriano, now chief executive at Manchester City, joined the Catalan club in 2003. Soriano's arrival was accompanied by sustained success on the field, with Barca winning eight Liga titles and four Champions Leagues since 2005. "There was a concentrated effort in the early 2000s to really capitalise on their branding and grow revenue accordingly," Bridge told Reuters. "The effort that went into ensuring Barca were as commercially viable was assisted by the fact the team performed so strongly, and the two things go hand in hand. "The strong performance of the team helps them get more idols in the team, which drives commercial value. People want to be associated with biggest and best brands and you have to pay for that exposure." Barca earn 58 million euros per year from their four-year shirt sponsorship deal with Japanese retailer Rakuten, which was signed in November 2016, outstripping the 38 million euros Real receive annually from airline Emirates, although that agreement is up for renewal next year. The two clubs' best chance of unseating United as number one in terms of revenues and brand values, however, depends on La Liga catching up with the Premier League in terms of worldwide audience. "It's about supporting the growth of the league overall to ensure international broadcast rights are maximised," added Bridge. "Barca and Real should want the league to be competitive; they should want their competitors to set high standards, to have new, full stadiums. They need to grow the overall pie, which they will, in turn, benefit from." La Liga signed a record broadcast rights deal worth 1.555 billion euros in 2015 after switching to a model based on collective bargaining. President Javier Tebas has said the next deal, coming into effect from 2019/20, could be worth 2.3 billion. The league has made huge strides in building its international audience in the past year and has switched Saturday's game between Real and Barca from its traditional Spanish night-time kickoff to a lunchtime start in a bid to broaden its appeal to viewers in Asia. 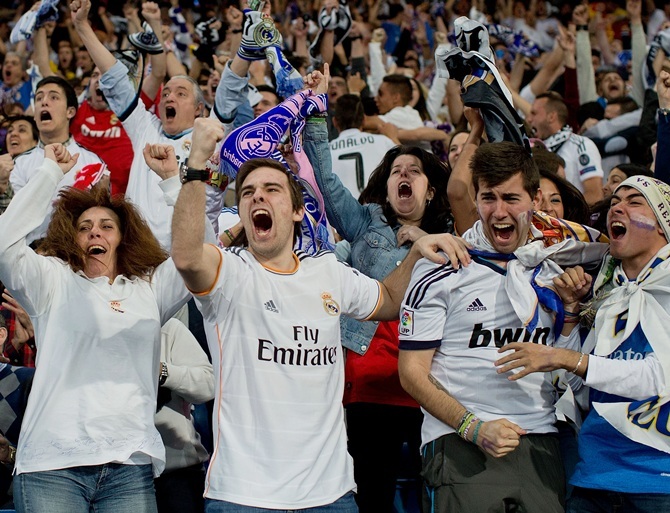 The objective is to use the popularity of the flagship fixture to promote the whole league. "One of our key priorities is to present La Liga as much broader than Real Madrid and Barcelona," said Joris Evers, La Liga's global director of communications. "They are the biggest clubs and brands within La Liga and we want to take advantage of the 'Clasico' to present the broader league, to tell people about more clubs because our job is to build the value of the product overall." EL Clasico: Watch out for Suarez and Ronaldo!